Theodore (Teddy) Roosevelt was the 26th president of the United States. His most notable achievement was as the first American to ever win a Nobel Prize -- he won the Nobel Peace Prize and for his slogan, "Speak softly and carry a big stick." He lived from October 27, 1858 – January 6, 1919. 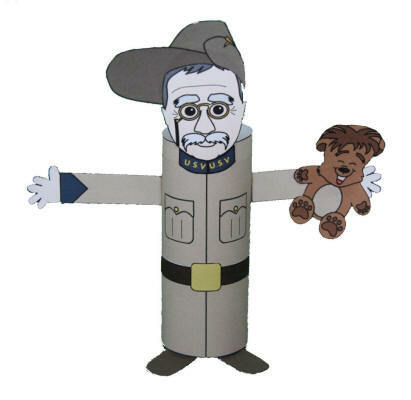 Another fun fact: In 1902 Theodore ("Teddy") Roosevelt went on a hunting trip. At the end of the day, he hadn't had much success, so a captured black bear cub (a baby bear) was brought for him to shoot. The president said no way and the story touched the nation. Soon a small toy bear was created that became popular around the world for generations to come -- the "Teddy Bear". Glue the belt around the middle of the tube. Glue the head onto the top of the toilet paper roll, just above the pockets. Glue the teddy bear into one of the hands.